I love PJs: Olivia von Halle! La prima cosa che ho pensato vedendoli e' stato: "Peccato indossarli per dormire!" Sono talmente belli, voluttuosi e super chic che ispirano il desiderio di un party piu' che una dormita. The first thing I thought of when seeing them was "It's a shame to wear them to sleep!" They are so beautiful, voluptuous and super chic that inspires the desire for a party more than a desire for a nights sleep. La designer londinese Olivia von Halle ha creato una marca assolutamente glamour per ogni fashionista. Sono perfetti per questa stagione fredda per oziare a casa in grande stile. Olivia Von Halle - il marchio e' nato nel 2011 traendo ispirazione dai pigiami lounging resi famosi da Coco Chanel nei ruggenti anni Venti - sta avendo un gran successo. Victoria Beckham, Gwyneth Paltrow, Lena Perminova, Katy Perry e Poppy Delevigne nonché la Fashion Editors a Vanity Fair, Harper’s Bazaar, e Vogue sono tutte grandi appassionati del marchio. London designer Olivia von Halle has created a totally glamorous brand for every fashionista. They are perfect for this cold weather to lay around the house in great style. Olivia Von Halle - the brand was born in 2011, inspired by lounging pajamas made famous by Coco Chanel in the Roaring Twenties - is having great success. Victoria Beckham, Gwyneth Paltrow, Lena Perminova, Katy Perry and Poppy Delevigne, as well as the fashion editors at Vanity Fair, Harper's Bazaar and Vogue are all big fans of the brand. Poi dulcis in fundo, Olivia von Halle, adora gli animali...questa la foto della sua boxerina Bathtub. 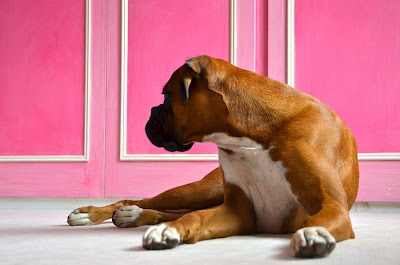 Last but not least, Olivia von Halle loves animals... this is the picture of her boxer, Bathtub. Sono in vendita, oltre che sul sito, da Harrods, Selfridges a Londra, e in USA Neiman Marcus - in 6 store - San Francisco, Houston, McLean, Bal Harbour, Beverly Hills e Dallas. They are on sale, besides the website, from Harrods, Selfridges in London, and in the USA at six Neiman Marcus stores: San Francisco, Houston, McLean, Bal Harbour, Beverly Hills and Dallas.